Residential & Commercial 10 and 20 yard roll off dumpsters. With Rubbish Inc., dumpster rental is as easy as ordering a pizza – and just as quick! Just let us know what you’re planning on loading into it, what size dumpster you need, when you need it by, and for how long – that’s it. Choosing a Size: Dumpster sizing doesn’t have to be a confusing volume formula! Whether you’ve got a small clean-up job or a major remodeling project, we’ve got you covered with the right size for the right job – at the right price. 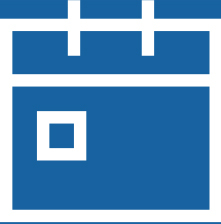 Pricing: We’ve made our pricing model so you never have to worry about hidden costs. Just keep us in the loop if your plans change- or the type of debris going in changes- and we’ll make sure everything’s on track. Duration of Rental: Our rental periods are planned with your convenience in mind. Whether everything’s already in a neat pile for a quick 30 minute fill-up, or you’re just getting started on an extended renovation- we’re here to make your project as easy as possible. We also know that sometimes projects don’t go according to schedule. If you need an extension, just give us a call and we can help you work it out. They say one man’s trash is another man’s treasure. But whether it’s a pile of yard debris or your old living room set, sometimes it all just needs to be hauled away – and that’s what RUBBISH INC™ does best! Get Started: Call or email for a simple, no-hassle estimate that’s quick and accurate – no hidden fees, guaranteed. You tell us what to take, we'll load it up, and haul it away the same day. Flexible Pickup: Decide when delivery is best for you – you don’t even have to be home! Just let us know where on your property you’d like the dumpster; we even accept photos to make sure placement is perfect. Flat-Rate Pricing: If you’re planning a clean-out but don’t know exactly how much will make it to the dumpster, our flat-rate trailers are simple – pay only for what you use. Running a jobsite while keeping on budget – and on time – means trusting each and every company you choose to work with. 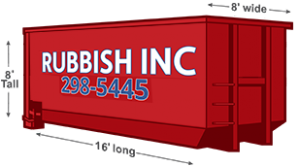 Our Preferred Contractor Program partners you with RUBBISH INC™ for all your hauling needs so you can focus on the important details of running your business. We also service major insurance companies for emergency clean up, storm clean up, and disaster removal. The Perks: As a Preferred Contractor, not only do you get discounted rates – you can earn free rentals as we work together. Don’t sweat the dumpsters when tight schedules and last minute jobs come up- we’ll have your back with priority and after-hours service. Don’t Waste Space: If your site is small or confined, our junk removal crews can come clear it out that day — no dumpster required. Consistency: Jobs change, deadlines change, but our pricing stays the same. If you’re not sure how much space you’ll need, just fill one of our flat-rate trailers and only pay for what you use. Whether you’re cleaning out old furniture from your garage, or you’re a contractor doing major renovation removing chunks of drywall- we’ll take it. Aside from a few things like hazardous waste and chemicals, we take anything and everything that you can fit below the fill line of your dumpster. Customer service is always our #1 priority. We are focused on how we can help you. RUBBISH INC is a locally-owned business, here in the heart of Austin, Texas. We are the only dumpster rental company offering both rentals AND junk removal services here in Austin- so that we can tackle any job that needs to be done. We believe in setting ourselves apart from the competition with friendly, knowledgeable staff, fair and straightforward pricing, and the best customer service in the business.